Dr. Soil, Unique innovative product in the form of Organic liquid fertilizer, which is a complete alternative of chemical fertilizer that helps in growth of plants while also maintaining the quality of land. 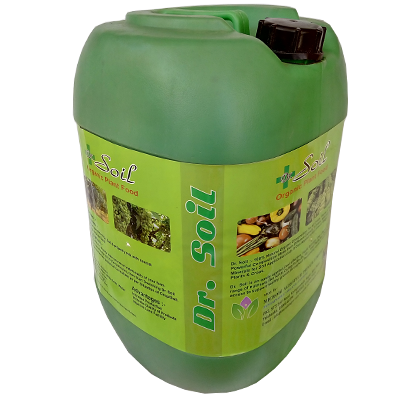 By natural process of decomposition Dr.Soil is balancing the PH of land and reduce the acidic part and neutralized the land. If the land is neutralized then absorptions of carbon capacity is increased and reduces the carbon foot print, which results in carbon credit and this process is important to get natural crop in natural environment. The most important aspect of farming is Biological Cycle (soil food web), where earth worms and other nematodes, arthropods, bacteria & fungi is no more because of chemical fertilizer, which produces sulphuric acid and that will kill the earth worms & destroy the entire biological cycle very badly. But use of Dr.Soil will create suitable environment and earth worms & biological cycle (soil food web) will be back naturally. So it will help to convert almost all physical nutrients matter in to available form for plants. By natural decomposition method Dr.Soil produce required gases like Nitrogen, And Ammonia also. These are helpful for plant to grow and create distance between two particles of land which can help roots to grow and get proper oxygen. Hard soil automatically softens and water holding capacity increases. Acts as a buffering agent and stabilizes soil reaction (pH). 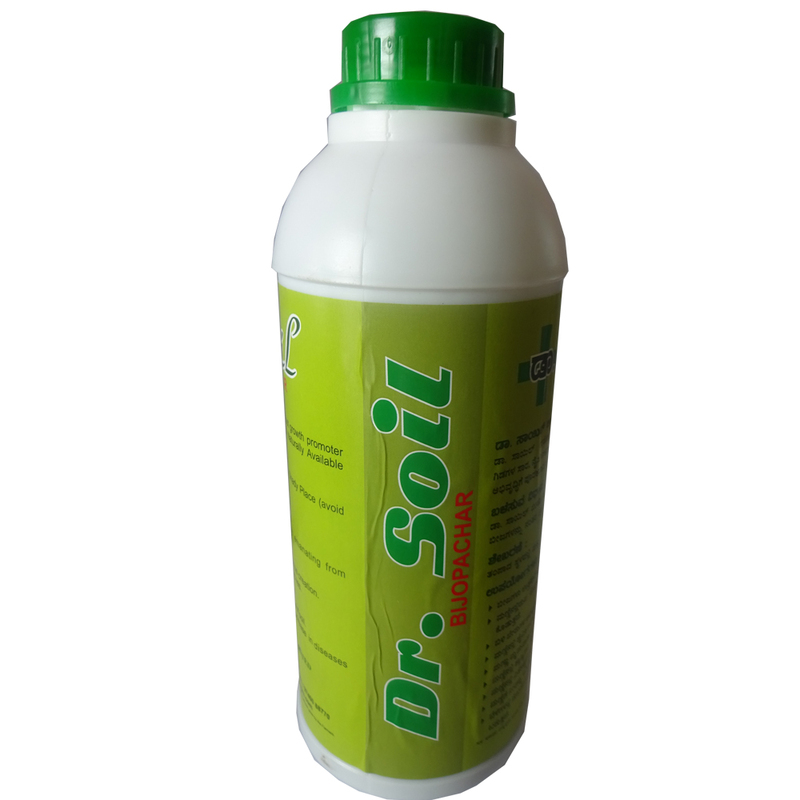 Enhances availability of soil organic carbon (SOC), soil organic matter (SOM), available NPK and micronutrients to plant’s. Source of energy for microorganisms which helps in performing various beneficial functions in soil (nitrogen fixation, mineralization etc.). Solubilizes some mineral compounds present in soil and make them available to plants. Chelates metals such as Fe, Zn, Cu, Mn etc.,for enhanced availability and uptake. Improves leaf quality and yield. Avoids chemical fertilizer application leading to reduced cost of production, besides supporting Environmental protection. Note: Out put is a matter of soil, water & proper treatment given by farmers. 100% Natural & Organic Composition. Four in One solution for all plant and trees. Powerful composition made from different extracts of trees & organic product of Nature. Increasing of the photosynthesis process of plants. Increasing the self immune power of plants. Protect from viral infection, insects & fungus effectively. First Dose start from 21th day of plantation. Second Dose after 6 days of 1st spray. Third Dose at time of flowring. Fourth Dose at time of fruiting. Shake well before use, Stir well. Store at room tempreature and keep away from sunlight. Keep away from children, if goes into eyes wash with clean water and take advice of physician. Don't use chemical used pumps to spray this product. It is Organic liquid for Seed Treatment & Root growth promoter formulated from different extracts of Trees & Naturally Available minerals. Mix Dr Soil Bijopachar with seeds & Dry in a Shady Place (avoid drying at sun light) and do seedling. Excellent sprouting / germination of seeds. Gives protection to roots from diseases emanating from disease causing pathogens present in soil. Excellent growth of white roots. Development of Eco / Bio environment and humus creation. Soil becomes humus / soft and soil fertility improves. Significant increase in water retention capacity of soil. Immunity to diseases improves and hence decrease in diseases resulting in fabulous yield. 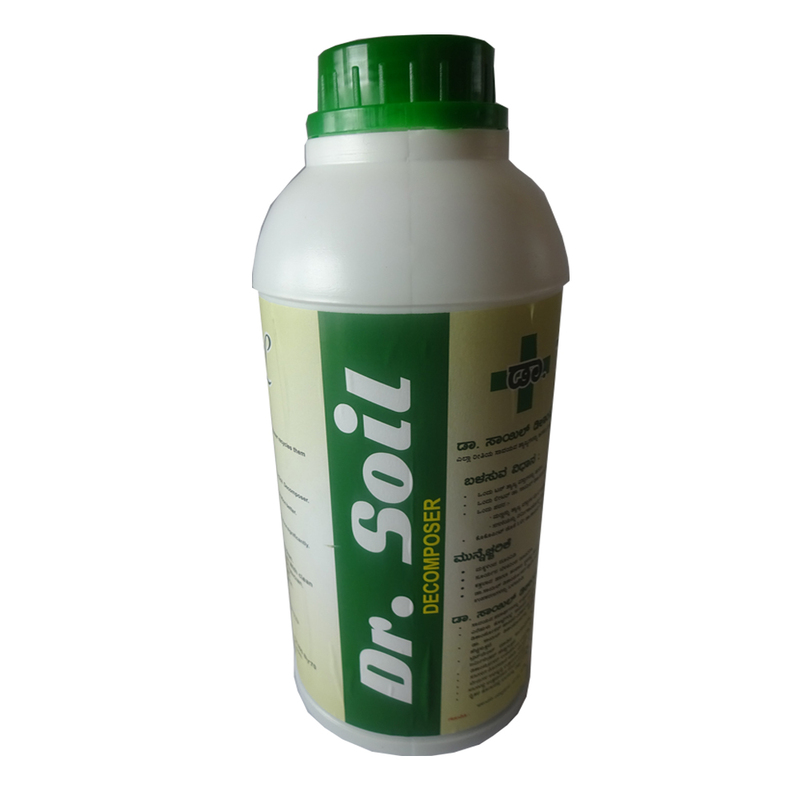 Dr Soil Decomposer is a one stop solution for Organic waste. Dr Soil Decomposer recycles them into an organic compost. It helps in decomposing organic matter quickly. To prepare vermin compost, fill the pits with organic matter & apply Dr Soil Decomposer. Earthworms will be generated, which will turn produces vermin compost. Using Dr Soil decomposer to coco peat will increase it’s ability. Treated coco peat can be used in nursery plants to make the process of germination better. After farmers planting the treated nursery plants, the number of deaths will reduce significantly. Plants will develop solid immunity system against any of the diseases. Spread cow dung on wet waste for vermin compost.